I got this palette on a flash 1 day Preview from Sephora here in Singapore but now it has officially launched in all Sephora stores here and also online. 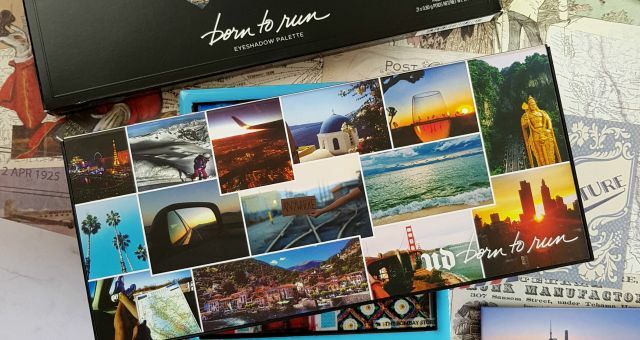 It has received a lot of social media hype and it has been launched with a lot of fervor. I am quite skeptical about products like these since I have been a little disappointed in the past with such hyped products. But, thankfully this palette doesn’t disappoint. 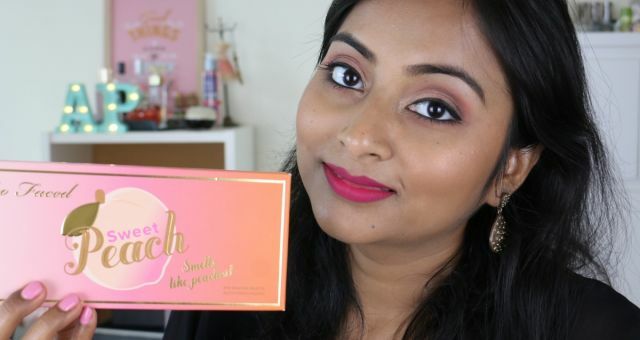 Read on to find out more and see the swatches. 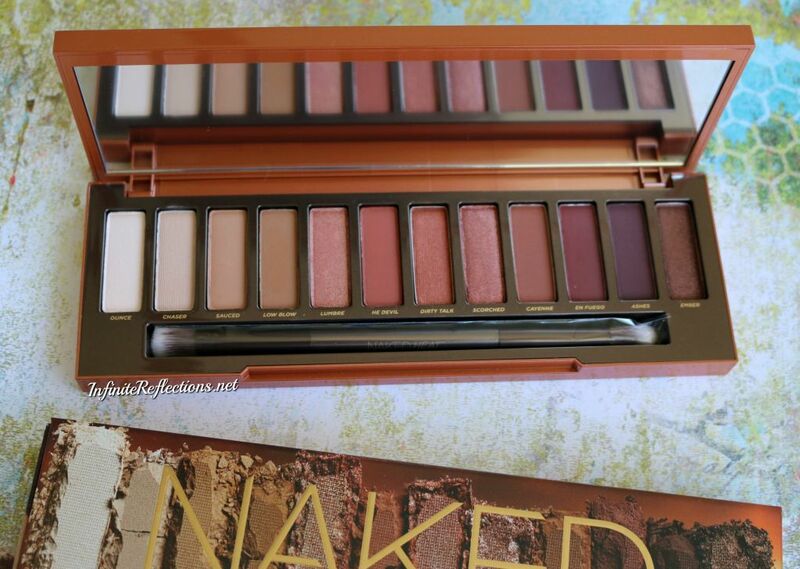 So, this is the fifth installment of the Urban Decay Naked line of palettes and probably the first full warm toned palette, keeping in tune with the current trend, of course. So, if you are someone who doesn’t like warm toned palettes, you are probably going to hate this. 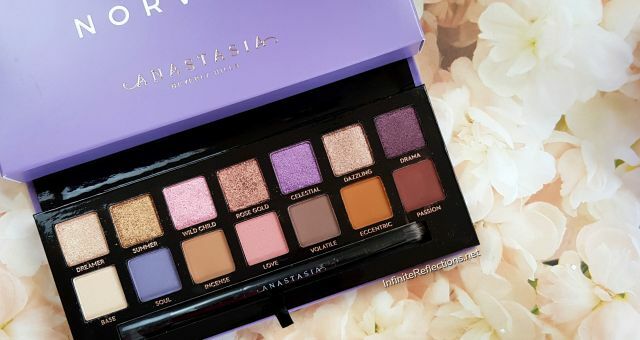 But, I live for warm toned eyeshadow palettes and this is totally up my makeup alley and the colours of this palette were just calling out my name. So, I had to get it and it being my first UD palette, I was super excited. 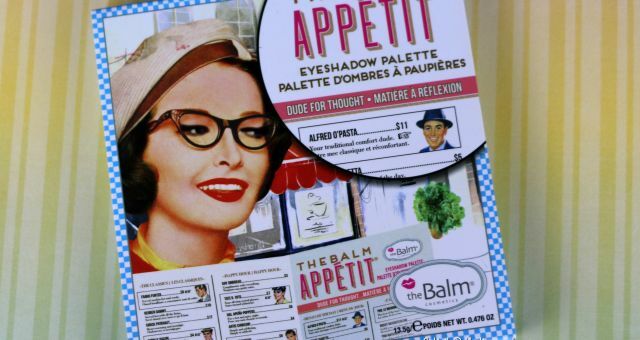 I really like the super cool packaging of this palette. You can already see that the colour scheme revolves around fiery reddish orange shades but what is interesting is that the package is designed around a matchbox design. The palette rests inside a cardboard case in the outer sleeve, giving it an illusion of a matchbox almost suggesting that we are going to paint our eyes in the colours of fiery warm flames. I think that this is a super genius packaging. The actual pallete cover also has an interesting design on the front with a plastic cover on top which has the palette name embossed on it. It feels very heavy, sturdy and tough even though the palette material is plastic, it doesn’t feel flimsy at all. This makes it very travel friendly. It also comes with a very good quality mirror and a very useable dual ended brush. There are 12 eye shadows in this palette and each shadow is 1.3 gm or 0.05 oz. In Singapore, this palette retails for SGD 83, which is same as any other UD palette. There are 12 eye shadows in this palette out of which 7 are matte, 4 are shimmer and 1 is a satin finish shade. The pigmentation of all the shadows are great. 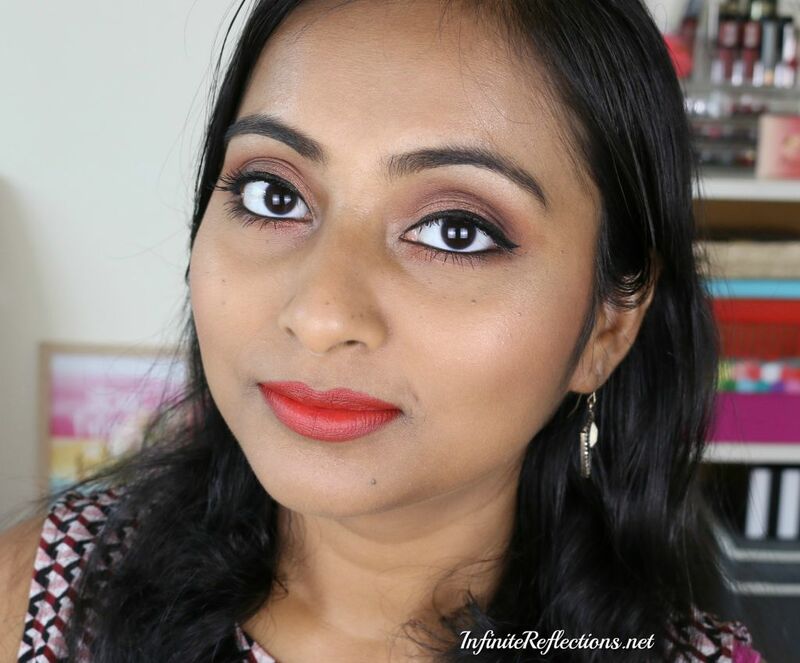 I would say that the texture of two matte shades (En Fuego, Ashes) are not very creamy smooth and feel a little chalky to the touch but they are superbly pigmented and they work really well on the eyes. Other than these two, all the other mattes feel very smooth and have a great texture. But all of them work and blend really well on the eyes. 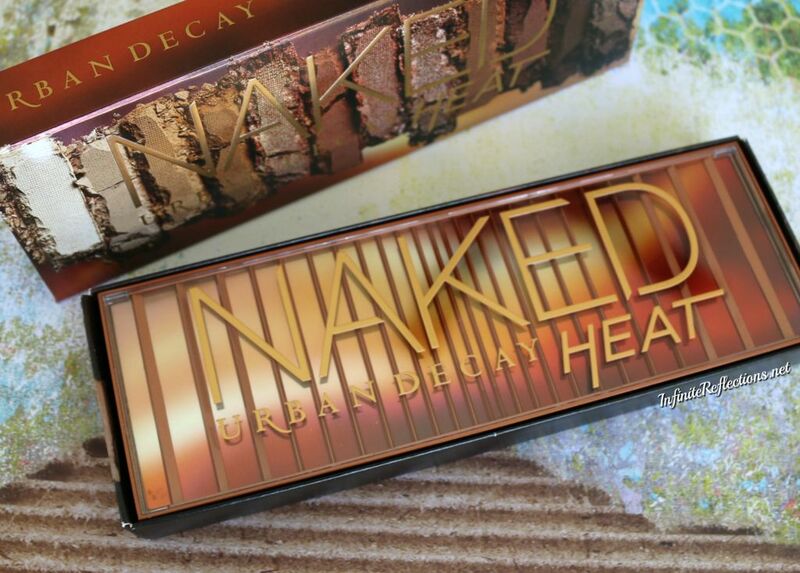 The shimmer shadows are just amazing quality specially Dirty Talk, Scorched and Ember. The pigmentation and colour payoff is just mind-blowing. The shimmer shade Lumbre looks like a rose golden duo-chrome shade with a gold shift. It is a very pretty shade and looks great on the eyes but I guess because of its nature, the colour payoff is not intense like the other three but it’s still amazing. There is one satin finish shade in the palette which is a white bone colour shade “Ounce”, which is also very pretty and has a good quality and colour payoff. I found that the staying power of these shadows is very good. I had them on my eyes for more than 6 hours and they stayed as it is. I will create more eye looks and see how they go. I always use eye primer for my eye looks so I did use eye primer every time. 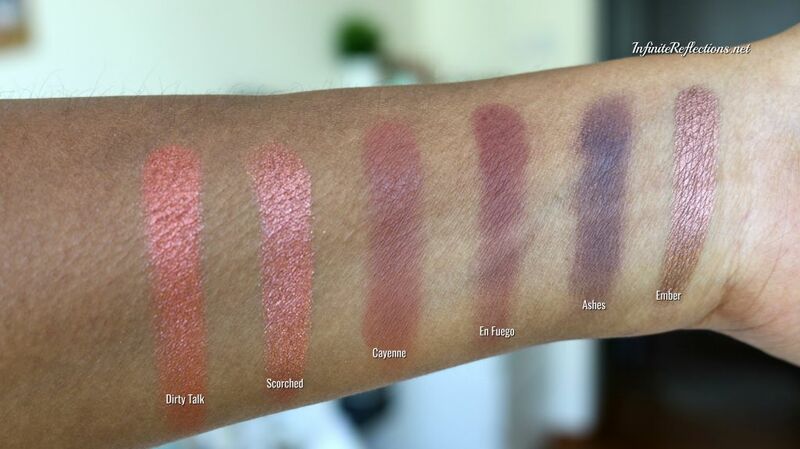 These are the swatches of the palette on my skin tone. 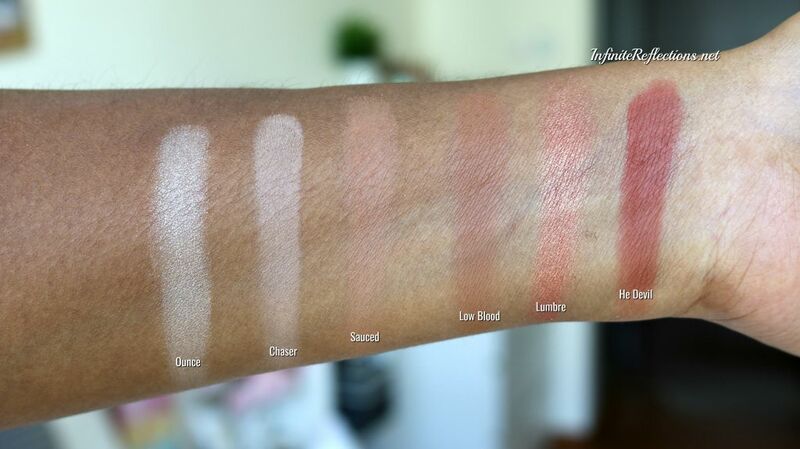 I have also included some close-up swatches ahead. This is the first 6 shades of the palette. As you can see, the shade “Lumbre” doesn’t look very intense on my skintone. I would have loved more colour-payoff for this shade. 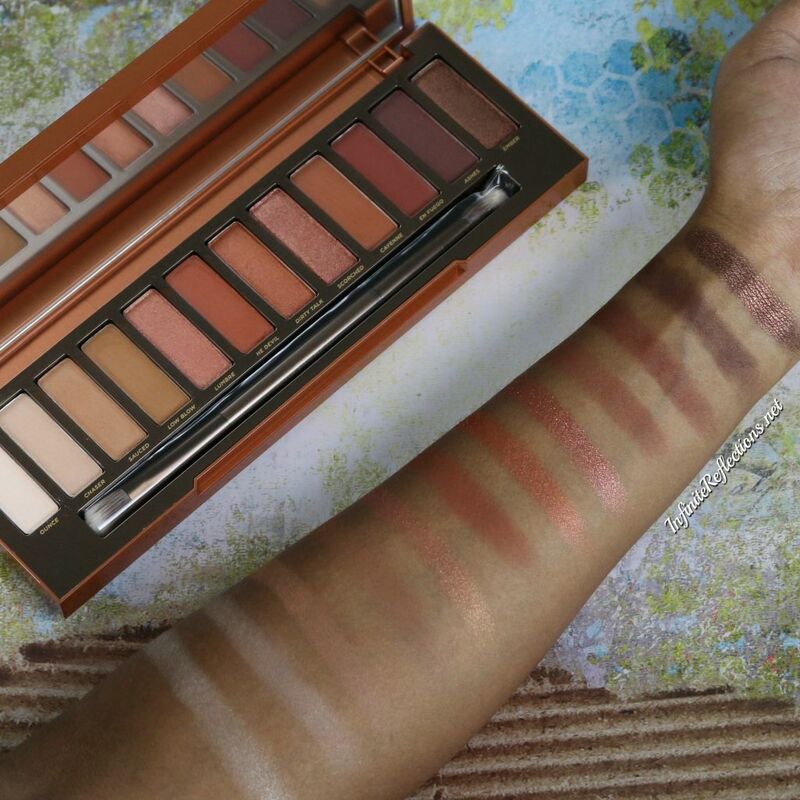 This is the second 6 shades of the palette. I have no complains about any of these shadows. Other than “En Fuego” and “Ashes” being slightly chalky to the touch I don’t see any issue with these shades. All of them perform well on the eyes. This is a makeup look I created with this palette. Overall, I am in love with this palette and it’s warm toned orangey reddish brown shades and can’t wait to create more looks with this. 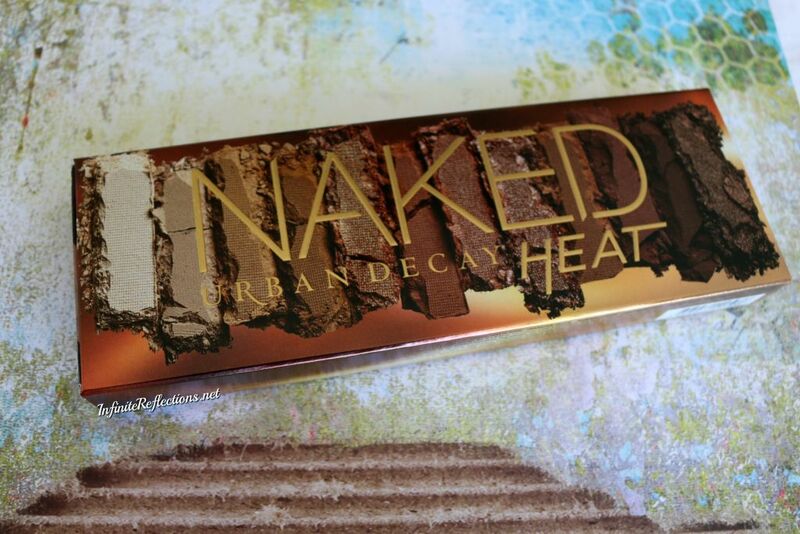 If you are someone debating whether to get this one or not, I will highly recommend this palette. But, also if you are someone who has a lot of high-end eyeshadow palettes you might not get a lot of unique shades in this palette. I am sure, if you dig through your collection then you will find colours which are similar already in your collection, so you have to be mindful of that. 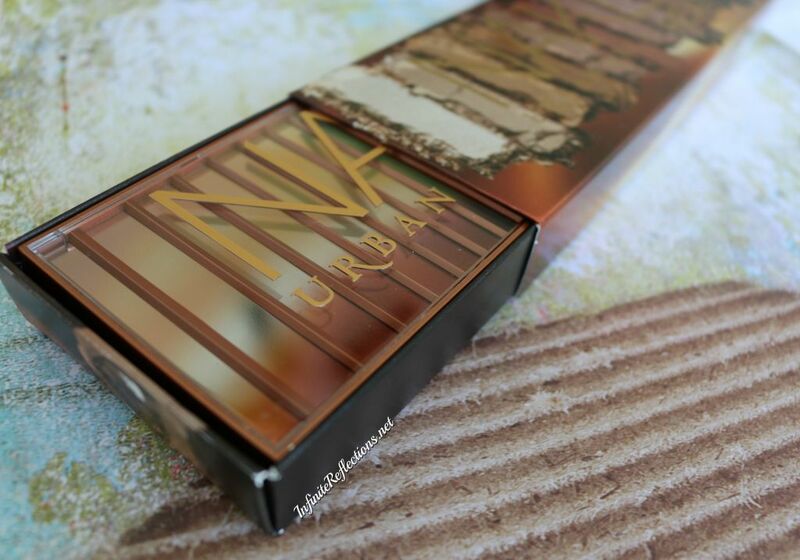 Other than that I think as a standalone palette, this one is totally worth it. That’s all for today’s review. Hope it was helpful. I can’t carry the Jaclyn Hill Palette around.. It’s too bulky.. I will still get it though someday when it restocks.. lol.. Honestly, I am not too much of a fan of Morphe palettes just because of their size. Yeah I am loving this too! 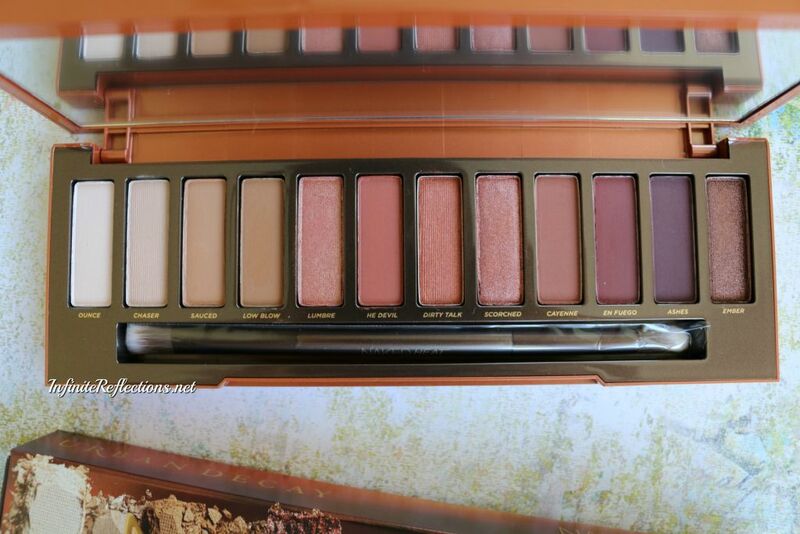 As u said it doesn’ t have unique shades , but still it is attractive paltte. Yeah I still love it. Quality is awesome!